In the top-left panel, click the Create a new workspace icon . In the Create New Workspace window, enter a workspace name and a brief description. 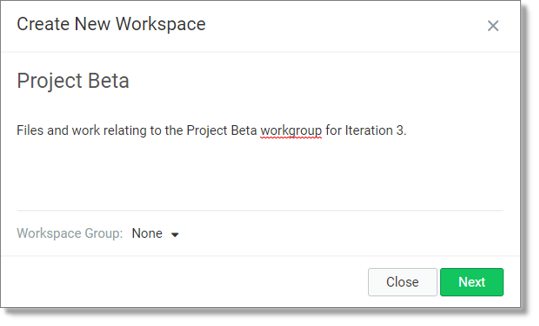 Select a workspace group (optional). By assigning your workspace to a group, you can filter your workspace. In the Workspace members window, click Add Members. 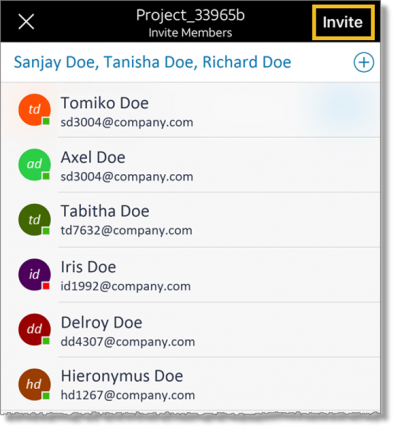 Select members from the list or enter the email address of organization members you want to invite to the workspace. -You can also enter the email address of someone outside your organization to invite him/her as a guest. -When you invite members, they receive an email from AT&T Collaborate with a link that they click to join the workspace. Invitation only limits membership to organization members or guests who have been sent an invitation link by a workspace administrator. Invitation and Anyone from [your organization] allows people in your organization to join by following a link. Invitation and anyone with a link allows anyone to follow a link to join the workspace. People outside your organization who follow the link will be added as guests. At the top of the Feed panel, tap the Add icon . The New Workspace window opens. In the New Workspace window, tap the Create Workspace icon . In the Create Workspace window, enter a name for the new workspace. Tap Create. The Invite Members window opens. In the Invite Members window, enter or search for the users you want to add as members of the workspace. In the Feed panel, tap the workspace where you want to add members. Invitation only limits membership to organization members or quests who have been sent an invitation link by a workspace administrator. Invitation and anyone with a link allows anyone to join the workspace. People outside your organization who follow the link will be added as guests.